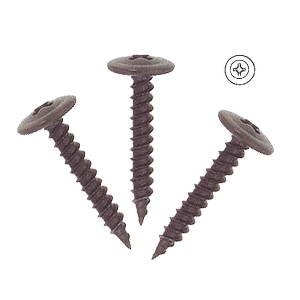 PRODUCT: #8 X 1/2" Round Washer Head (Modified Truss Head) sheet metal screw / K-Lath Lathing screw, Fine Thread, Type A Sharp Point, #2 Phillip Drive, Black Phosphate Finish. 1,000/Bag. Price/Bag. Designed for stud-framing and atttaching studs to track of 20 gauge metal. Sharp points provide fast penetration. Black Phosphate is an indoor finish, and not recommended for exterior or moisture exposed areas.